Jim the Ragtime Pianist playing outside Casey’s Corner counter service restaurant on Main Street USA in the Magic Kingdom, Walt Disney World, Orlando, Florida. Nikon D750/Tokina 16-28mm, 1/125s, f/2.8, ISO 1400, EV +0.3, 16mm Focal Length. Disney themeparks are full of surprises. You can literally turn a corner and find yourself listening and interacting with Jim, the Ragtime Pianist. His piano has a mirror on it allowing Jim to interact with guests as he plays tunes from the turn of the 20th century. He even interacts with you like it was still the early 1900’s. For those who may not be aware, I write a weekly photography blog for AllEars.net, one of the most popular Walt Disney World planning websites on the Internet. There, I shared more photographs of Jim, the Ragtime Pianist. 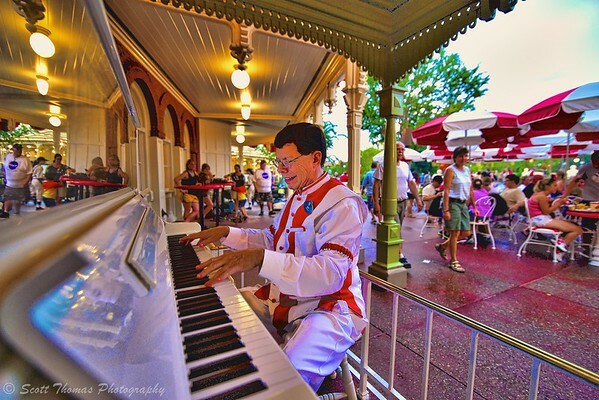 This entry was posted in Travel, Weekly View and tagged entertainer, entertainment, florida, intensify pro, macphun, magic kingdom, main street usa, nikon D750, orlando, piano, play, players, playing, tokina 11-16mm, uwa, walt disney world, wide angle. Bookmark the permalink.